April is the hottest month of the year in Thailand, and in the old times when the refrigeration did not exist, eating the rice with Jasmine and candle fume scented water was the way to cool down the body temperature. ข้าวแช่ [kâao châe] is the name of this dish. 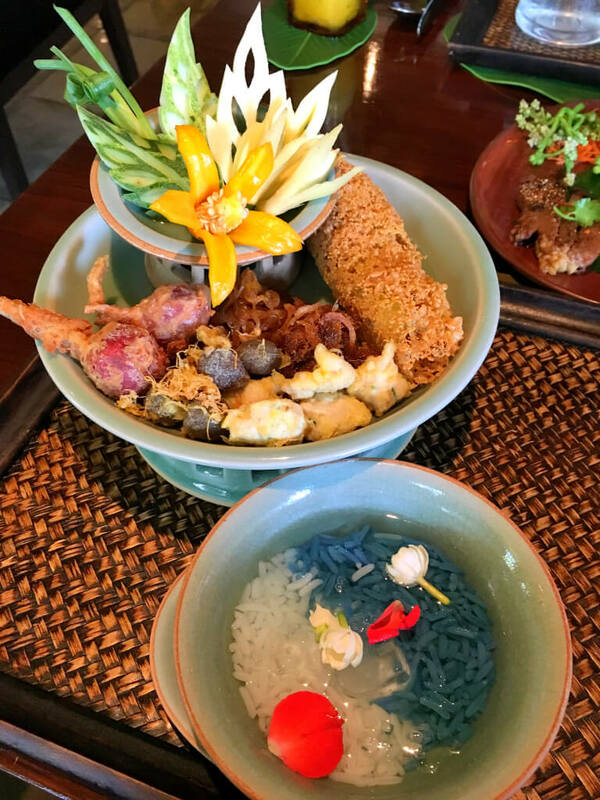 Almost 200 something years ago ( during the reign of King Rama II ) Kao Chae was introduced to the people in the palace to be eaten in during the summer months. As a note, ice was not brought to Thailand until the reign of King Rama the IV, therefore, in the past rain water was used and kept cool in an earthen ware pot in a dark place where the sun’s warmth couldn’t reach it. What makes this dish tasty is the side dishes which are five to six different things. There are many various recipes, but the essential remain the same. The restaurant I went serves five side dishes. Ka Pi ball (ลูกกะปิ: luk kapi) made from shrimp paste (กะปิ) which is seasoned with wild ginger, shallots, garlic, palm sugar, all of which are pounded together into a thick soupy mix, placed in a wok and then heated to evaporate the moisture so that a paste of highly scented shrimp paste is achieved. Afterwards it is allowed to cool and then rolled into a small ball. Stuffed shallots (หอมแดงยัดไส้: hom daeng yud sai) It is Thai shallots stuffed with ground fish meat, herbs, spices, fish sauce, and palm sugar, and later dipped in batter then fried. Stuffed sweet peppers (พริกหยวกสอดไส้: prik yuak sord sai)The peppers are stuffed with herbs, spices, and ground pork. Then they are steamed, allowed to cool, deep fried, and lastly wrapped in the lacy egg wrap. Shredded sweetened beef or pork (หมูฝอย: muu foi หรือ เนื้อฝอย:nue foi) depending on the preference of each recipe on whether they like pork, beef, or fish. The meat are teared into strands, seasoning with palm sugar with fish sauce, allow to dry and then deep fried. Raw mango, fresh cucumber, fresh wild ginger, fresh chillies and fresh spring onions are served together to balance the sweetness of the side dishes, and helps digest and eliminate the fat. 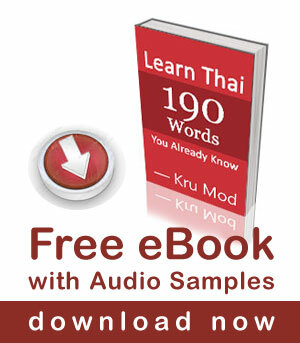 How to eat Khao Chae? I will be honest with you that today was my first time eating Khao Chae, so I did not know there was a proper way to eat this dish. 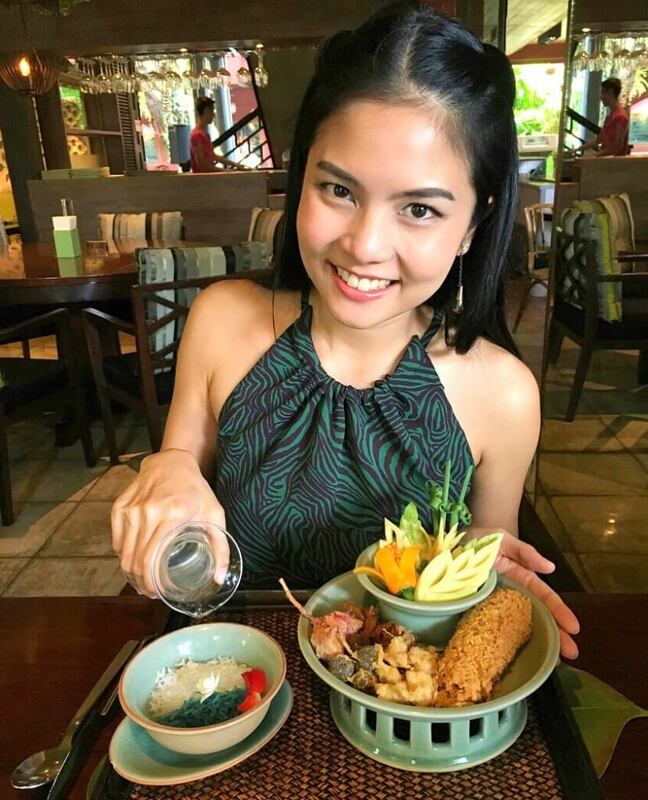 You should take a little bite of the side dish, chew a bit, follow by the fruits or herbs as chasers, then follow with a spoonful of the icy rice. What I did was I put the side dishes I wanted to ate into my bowl of rice and had the vegetable at the end just because I am not a big fan veggie. lol Oh! well next time you will do it right Mod! I went to “Than Ying restaurant” where the recipe created by M.C. Sulapwanleng Wisuthi during the reign of Rama VII’s reign. It is about three minute walk from Surasak BTS Station. It is located at Pramuan Street , off Silom Road, between Silom 17 and 19. Reservations recommended. Another place I like for Khao Chae is the restaurant in “Jim Thompson House Museum”. I love the two-colored rice and their side dishes are flavourful and well-made. The attention they put into the vegetable on the side is also very lovely. It is rare to find a Thai restaurant that serves crafted vegetable these days. I really appreciate their effort to present this Thai art. Jim Thompson House Museum is located on Rama I Road. It is a walking distance from National Stadiam BTS station. 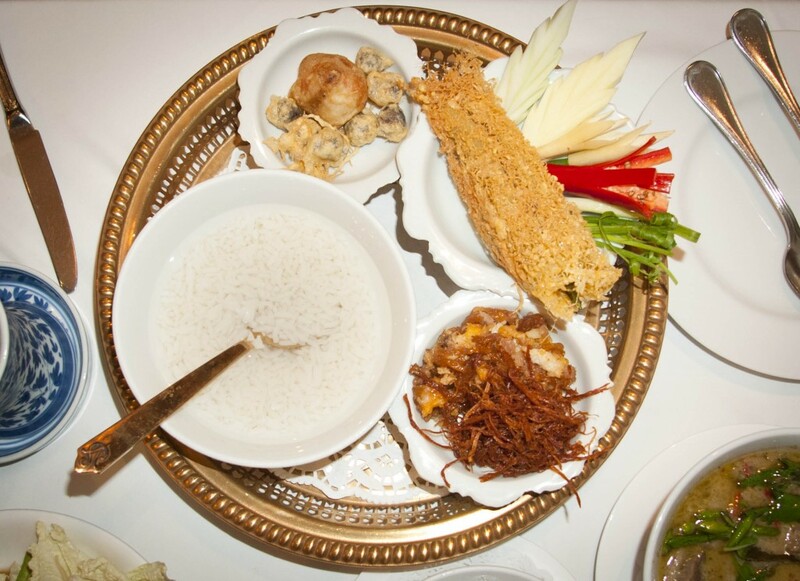 Their khao chae arrives with elaborately presented carved vegetables. This sweet grandma sells khao chae out of her home. Her recipe is also M.C. Sulapwanleng Wisuthi’s, and she says she used to work in her kitchen. A Mon recipe passed down for 200 years. The recipe was passed down to Chef Chamnan Thepchana from the aristocratic, Malakul family. Some of the ingredients like jasmine flowers are grown in the chef’s own garden. Thank you for recipe details from ChefMcDang.com and restaurants info from BK site and CNNgo. Unfortunately if you look what happens in the streets, Songkhran looks more like a western festival; beachwear parties with colored water guns.